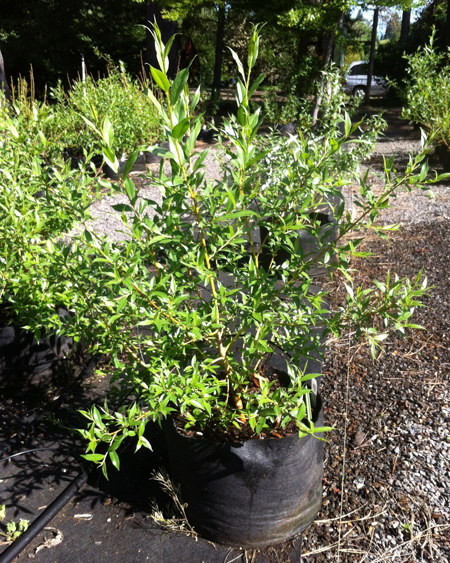 This gorgeous green willow is a species that we collected in the Three Sisters Wilderness on the north side of broken top at elevations around 7,000 feet, where it formed in clumps about 4 feet tall with lush, dark green stems. Ornamental buds in the spring. Excellent for placing along streams and water features when you want to maintain the view. Long, narrow dark green leaves. This variety of willow is accustomed to slower alpine growth habits, so will grow slowly and won't grow rapidly out of control.